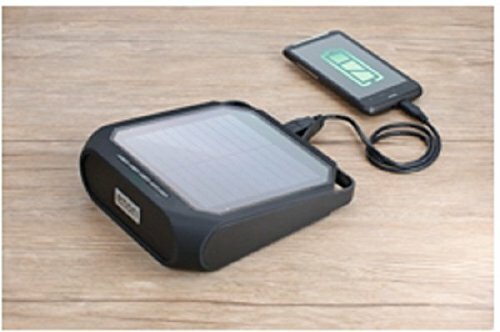 As an off-grid product, Rukus is a two in one smart solar gadget that makes life easy for your whenever. If you love working outside and around your house on sunny days, you will love it even more when you get this gadget for yourself. You will love it when your work and Tukus is blasting your favourite tunes keeping your energy level up. This will all happen when you get your Eton Rugged Rukus The solar-powered, Bluetooth-ready, smartphone-charging speaker. 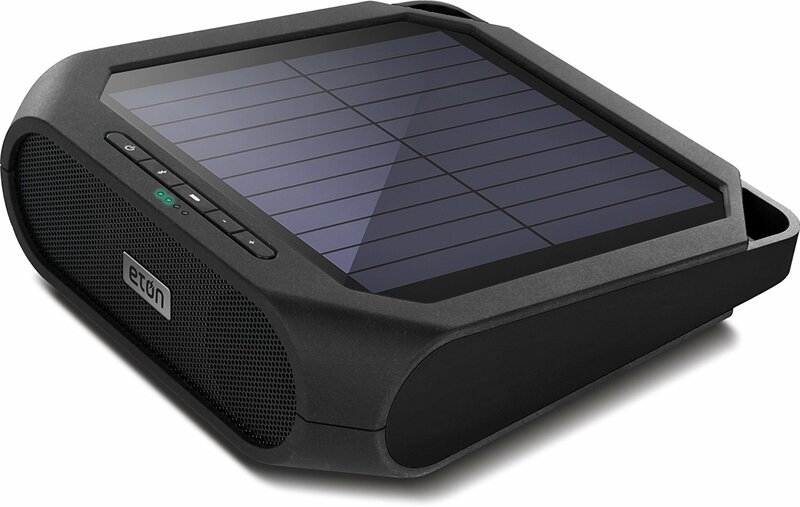 Product name: Eton Rugged Rukus The solar-powered, Bluetooth-ready, smartphone-charging speaker. 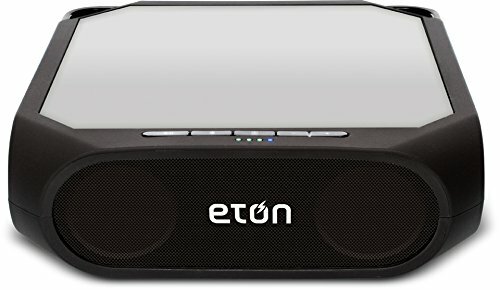 ETON NRKS200GR Rugged Rukus Solar-Powered Bluetooth Speaker take your music with you everywhere, the solar energy from the sun will power the Rukus to keep your tunes playing all day long. If your phone battery discharges, no worries, plug it into the Rukus to get a charge. The Rukus is also a power bank. When it gets dark, the internal lithium battery will keep the music going for hours or you can use the included USB cable for non-stop songs. Stream all your music from almost any Bluetooth-enabled smartphone, tablet or computer. And for non-Bluetooth devices, there is an aux-in. It’s time to for Rukus! The Rugged Rukus is primarily a wireless Bluetooth speaker, although it does have an auxiliary input for a wired stereo minijack connection.it only takes a few minutes to pair the gadgets with your music Bluetooth source. Rugged by name and nature. There’s no question this system was built for outdoor use. If you were watering the garden and the wind shifted, momentarily showering the Rukus. No problem. Rubber flaps protect its inputs and outputs and drop just beads up on the casing. So you’ll have no worries taking the Rukus poolside (but don’t actually take it into the pool). The top of the Rukus is covered with a solar panel. For outdoor activity, it’s ideal. The device can fully recharge in less than five hours of direct sun.The Rukus has a USB charging port for a smartphone, which comes in handy as the day progressed. When the Rukus is pointed straight directly to the audience, one would enjoy the music at moderate volume levels. When moved around and listening off-axis one needed to crank it a bit more. Of course, the Rukus is small and light enough to be moved around, too. So as you work in different parts of the yard, just pick up the Rukus and plop it down in your new location. Why purchase the Rugged Rukus? Wherever there’s the sun, you’ve got an instant party. Connect wirelessly to any Bluetooth enabled device and start blasting your favourite tunes in stereo sound. The super-efficient monocrystalline solar panel powers both the music…and the fun. Stream all your music from any Bluetooth-enabled smartphone, tablet or computer and control your tunes from your device. No wires. No docks. No hassle. With one-touch pairing, you’ll be jamming in no time. Thanks to the USB port on the Rugged Rukus, you can charge your favourite mobile device while you listen. Now that’s super smart and convenient and technology we need. With its lightweight, durable design and carabiner-ready loops, it’s perfect to take on your backcountry adventures, just hook it on and hit the trail. This is a great outdoor solar-powered Bluetooth speaker. I would use this at the beach, poolside, on a hike, on the deck — anywhere outside. Because it’s solar-powered, long exposure on a sunny day can keep the Rugged Rukus charged and ready. And being able to use that stored power for a smartphone is an added plus — especially when you’re outdoors and far from an outlet.